Ignoring my own advice, I determined to find a holiday film that I could honestly endorse before the 25th came around. After some casting about, I decided to order a cult Czech film that I’d heard many good things about called “Three Wishes for Cinderella.” In some countries it is known as “Three Nuts for Cinderella,” a title which is surprisingly interchangeable (I’ll explain that later). 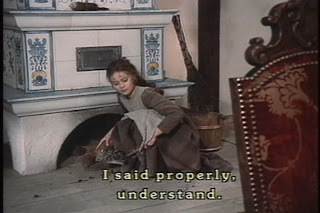 “Three Wishes for Cinderella” (1973) serves roughly the same societal role for Europe as “It’s a Wonderful Life” does in the US. 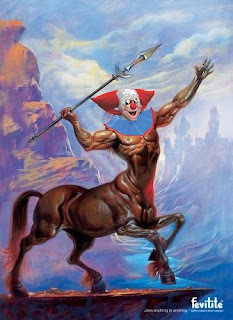 It’s a magical, feel-good fantasy that brings together the community and appeals to every generation. The film is a perennial classic in Germany and Switzerland. In the Czech Republic it is a national landmark; part of the cultural landscape. 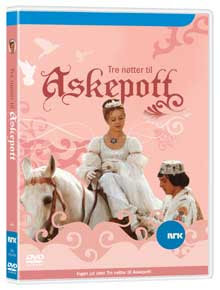 In Norway, the film is virtually a religion: public demand has decreed that the state television channel play it ritualistically every Christmas morning at the same time. In the US, nobody has any idea what you are talking about when you mention the film. Americans like to be left alone with Charlie Brown’s holiday foibles and claymated Rudolphs that look like nightmare Bozo-the-clown centaurs. “Three Wishes for Cinderella” tells the classic Cinderella fairy tale without a hint of irony. Unlike the Disney animated feature from 1950, which reigns supreme over the American mindshare of the story, this Czech version has much more genuine, down-to-earth tone, a light, desaturated palette and a whimsical atmosphere. 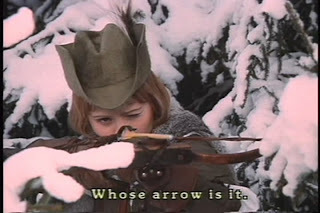 The dense, folksy mise-en-scene reminded me of a sweeter, child-friendlier “Alice” (1988), a Czech fantasy film that was probably influenced by this feature. Cinderella is played by Libuse Sanfrankova (I’ve omitted about seventeen accent marks so don’t even try to pronounce it) to great effect. She lives in a quaint village snugly tucked into a wintry forest near the local castle. Her stepmother and sister, jealous of her beauty, happiness and good-nature, try to saddle her with a life of drudgery. Their cruelest form of torture is to pour two types of seeds on the ground for Cinderella to separate. Tedious, and kind of random, but the poor maiden can always call on friendly doves to help. 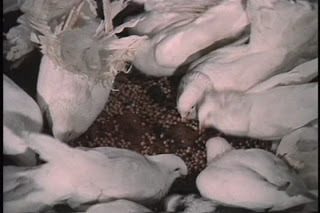 Since the film is live action it is kind of cool to see real birds being used, though I suspect they were eating a lot more seeds than they were collating. The town is in a flurry since the king (and his thoroughly eligible son) is due to pass through. Cinderella sneaks off with her trusty horse to frolic amongst the towering pines. She inevitably runs into the prince’s hunting party and saves a deer from his blood-sport. 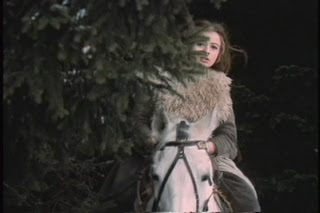 As bold and mischievous as a forest nymph, she leads the lads on a goose chase through the snow, at one point stealing their steeds and finally slipping away without giving her name. Word gets out that the King is hosting a ball for the prince to select a bride. 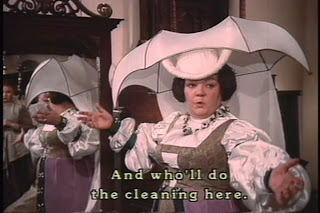 Cinderella’s mother orders all sorts of fantastic fabrics for the favored filial relation, but the merchant who goes to fetch the goods promises to bring back a present for Cinderella, too. He forgets and falls asleep on the coach ride back. The prince comes upon him while bow hunting, and shoots a birds nest at just the right moment to drop it on the merchant’s head. The prank startles the man, but also pleases him. In the nest are hazelnuts that he gives to Cinderella. The three nuts are magical and grant wishes. I’m pretty sure this is mixing up Jack and the Beanstalk with Cinderella, but I’m not complaining because it saves us from suffering a fairy godmother character. Under the protective eye of a friendly owl, Cinderella transforms her hazelnuts into various outfits. It’s unclear whether she could have asked for anything she wanted (like a robo-dinosaur) , because in true ingénue fashion, she only desires pretty clothes. 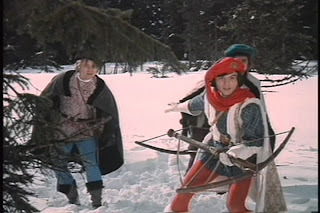 This must be some type of olden European thing (from before people dared dream of robo-dinosaurs), because it also happens in my favorite Charles Perrault fairy tale, Donkeyskin, which also has a fantastic film adaptation. She first asks for huntsmen gear so that she can best the prince in a test of archery. Later she transmutates a gauzy gown for the ball and, after the whole glass slipper rigmarole, she uses the final nut for a wedding dress. To some degree, the film plays like the wish-fulfillment fan fiction of a thirteen-year-old girl. There is a preponderance of horse-riding, dressing up in pretty clothes and showing up boys while remaining perfectly graceful and conspicuously pretty. Oh, and at the end she consents to marry the handsomest and most wealthy person in the land after he desperately combs the countryside for her. However, even fan fiction, if executed extremely well, can be quite enjoyably. 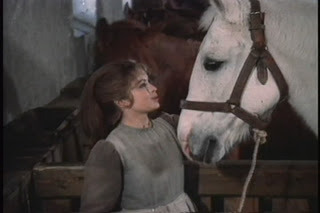 Libuse Sanfrankova’s lead performance is one of the reasons the film works. Though twenty at the time, she looks no more than fifteen in the film. She possesses all the innocence, enthusiasm and ethics that a good fairy tale heroine needs, but demonstrates a competence in horsemanship, archery and climbing that modernize her into a girl-power emblem. The regal realities of feudal governance, class-based oppression, political intrigue and Haemophilia are not for Cinderella, but she does show such benevolence, initiative and tolerance for work that one could imagine her growing into a beloved leader. She is so in control of her destiny that I doubt she even needed the magic hazelnuts to win over the prince: in addition to her charming personality and impressive resume of Renaissance skills, she is also remarkably pretty. Amongst the many imdb testimonials of girls enchanted or inspired by the film are several male confessions of long-lasting crushes and even one slightly disturbing tale of a boy whose standard for beauty was set so high by Sanfrankova that it soured his later relationships. 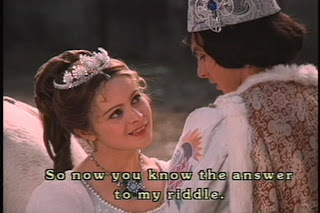 Director Václav Vorlíček is quite liberal with Perrault’s original telling, giving Cinderella far more agency. At one point, the prince tells her that he shall make her his bride. She responds by chiding him for not asking her how she feels about it and then playfully rejecting him despite his pleas. It’s nice to see the subtle feminist touches, especially compared to today’s gauche Hollywood appropriations like “Shrek,” where any positive message comes watered down with crudities and pop-culture references. Despite the praise being heaped on “Enchanted” (in theaters now), I can’t help think that Hollywood hasn’t yet learned its lesson, and I’m staying away for the time being. A surprising place where “Three Wishes for Cinderella” succeeds is in the immaculate cinematography, not usually of much interest in family fare. The whole thing is lens in a glittery soft-focus that makes the light seem to hang in the air. The snow-covered, unspoiled woodlands (somewhere in the Bohemian Forest) is put to good use filtering in the dappled sunlight and reflecting it ambiently off the snow-covered hillocks. The film looks a little low-budget and dated from a modern perspective, but the lack of CG, shine and crispness give it a homely, earthy charm. 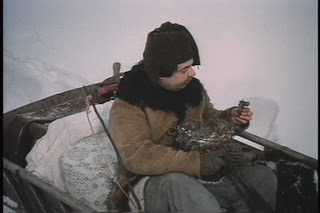 The sets are not highly dressed, but the richness of texture from the wood grains, muddy slush and festive costumes makes the suspension of disbelief a pleasurable task. So, for anyone who found my scrooge-like ranting about holiday films to be a cop out, now they have something to watch for the Christmas season. It has just the right levels of escapist appeal and positive underlying values to ensure warm fuzzy feelings for families and young-uns. Plus, you can finally see what all those Czechs and Norwegians are talking about. My brother reports that the first third of Enchanted was a great parody of past Disney conventions, but the remainder forgot it was a parody and succumbed to the very conventions the first part poked fun at. Might be one to view when it comes out on DVD. This isn't exactly a holiday movie, but I saw Mr. Magorium's Wonder Emporium at the dollar theatre last night, and I was pleasantly surprised. The production staff had a lot of fun making it, and it shows. For an example, check out the movie's IMDB page and note that the credited title of Dustin Hoffman's part is "Mr. Magorium, Avid Shoe-Wearer." i'm glad you made me aware of this, very much enjoyed it. watching it, i thought the lead actress looked familiar and later found she was featured in the excellent "kolja." to be honest i would never have guessed that this has taken on a wizard of oz status as a holiday icon in several european countries, but that's cool. far from a great movie, but a nice tradition for sure. As I am German I can only say that this is the best cinderella version so far. Disney does a great job on fairy-tale movies, but they are still not as good as old chezch ( I don't know if this is the right spelling) fairy tale movies. Really, Disney could learn a lot from this movie. An absolute have to watch!!! I from belgium and I adore this movie.it's the best cinderella story ever made. the soundtrack of this movie is magical. 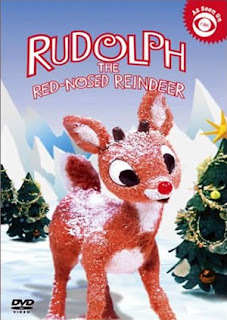 every christmas i watch this movie because I love it so much. the actress who playes cinderella is the most beautiful girl i have ever seen. I am in solidarity with your love for this film. I've seen it a couple of times now since my first viewing and it continues to grow on me. Yay for a sincere, guilt-free and totally charming Cinderella film! Thanks so much for your review. Good to know the background and the popularity of it in Europe. I was 7 years old when I seen this in Canada and haven't seen it since. Thanks so much!!! I'm Czech. As such, I love this film. So I'm glad you liked it, too. However, I'd like to correct you on your facts... This is not a take on Charles Perrault's story, but on one tale recorded by Czech writer Božena Němcová in 19th century. It was no doubt influenced by the more famous versions, but there are differences - like the nuts (and thus no fairy-godmother character). Nothing to do with Jack and the beanstalk, really. My sister has a book of Pavlíček's three scripts for fairy tales, Cinderella, Bajaja and "Královský slib" which he wrote after 1989 - the script looks just as promising as the previous two, but the filmed result is much less satisfactory. In my opinion, Princ Bajaja's execution is closest to the original script - all of the films made changes, but Bajaja kept much of the atmosphere I felt when reading the script. 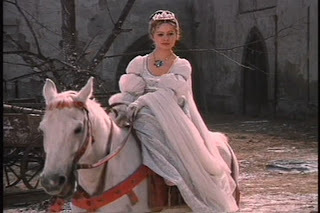 Cinderella was moved to different levels because it was filmed in winter. The changes in Královský slib, alas, only butchered the original story and the ideas behind it, ditched the messages for the entertainment factor, and not very well. I will definitely keep a lookout for Princ Bajaja, though I can't seem to find a copy readily available. Looks like there was a VHS release at one point, but it is rare and PAL, and the Czech/Germany DVD has no English subtitles. Any ideas? Looking at the comments on CSFD (Czech version of IMDb) makes it clear that not everyone gets the film. But I still think you would. Another adult-oriented fairy-tale you might like is Juraj Herz's Panna a netvor, a version of Beauty and the Beast, based on the poet František Hrubín's retelling. I am Czech and I am glad that this Cinderella is little bit known outside my country. On the other hand, I thing it is unfair that this fairy tale (perhaps because of German co-production) is more known than two czech fairy movies, which are a bit even better than this (CSFD share the opinion with me). I mean "S čerty nejsou žerty" (Give the Devil His Due) - Devils are not evil - and "Byl jednou jeden král" (Once Upon a Time, There Was a King) - fairy tale similar to King Lear, with Jan Werich and Vlasta Burian (great comedians) staring. I'm not sure whether there are available translations of these movies, or whether they were also so popular as Cinderella. Their quality lies in something slightly different - "Byl jednou jeden král" is based primarily on humor. "S čerty nejsou žerty" gives a balanced mix of action, humor and bad guys. Yet they are fairy tales as well as "Three Wishes for Cinderella". Suggestions on where to go to purchase movie with English subtitles? It used to show in the UK every christmas on Saturday mormings. I remember it as a kid - I'm now 42. There was something in the UK press a few years ago that it wasn't going to be on in the UK that christmas. My wife is Czech, so I got re-introduced to it, along with all the other Czech fair tales, e.g. "jsem mali ali sikovne" forgive the spelling. Back to pavelka = i'm sure she'll re-appear one christmas in the UK (they are always dubbed into English. As a High-class Indian escorts and Companion arranged in Malaysia and the City - I am open for no specific reason, suggestive encounters with considerate colleagues (or couples).